Criminal justice systems are barometers of social development. This claim, put forward by German criminal law scholars, alludes to the fact that inherent in the criminal justice process are conflicting interests between the need to ensure comprehensive fact-finding on the one hand, and the wish to safeguard individual rights, especially those of defendants, on the other hand. In all criminal justice systems, there exists a strong public interest in determining the truth due to the assertion that a determination of innocence or guilt is based upon “true” facts. This pursuit of “the truth” has led to procedural rules that expose both suspects and witnesses to coercive measures that often interfere with individual rights. In recent decades, human rights have come to the forefront in criminal justice systems around the world, but at the same time more and more jurisdictions have adopted exclusionary rules. Country reports on Germany, Switzerland, P.R. China, Taiwan, Singapore, and the U.S., along with contributions discussing the rationales behind exclusionary rules, legal practices, or potential alternatives, all address the question of whether, and under what circumstances, the use of exclusionary rules can be an effective means for protecting human rights in criminal proceedings. Criminal justice systems are barometers of social development. This claim, put forward by German criminal law scholars,1 alludes to the fact that inherent in the criminal justice process are conflicting interests between the need to ensure comprehensive fact-finding on the one hand, and the wish to safeguard individual rights, especially those of defendants, on the other hand. In all criminal justice systems, there exists a strong public interest in determining the truth due to the assertion that a determination of innocence or guilt is based upon “true” facts. This pursuit of “the truth” has led to procedural rules that expose both suspects and witnesses to coercive measures that often interfere with individual rights. Modern day criminal justice systems are designed to not only ensure comprehensive fact-finding, but also protect the human rights of defendants, victims, and witnesses. Individual rights applicable to criminal proceedings include the right to have one’s dignity respected, protection from physical force and torture, the right against self-incrimination, and the right to privacy of person and property. Because these rights run counter to authorities’ fact finding, they are regularly at risk of being disregarded. As such, preventing human rights violations remains a challenge within criminal procedure law worldwide and the means to do so are limited. A promising method of reducing human rights violations is the exclusion of illegally obtained evidence from trial. The rationale behind these so-called exclusionary rules is the expectation that law enforcement officers will refrain from engaging in unlawful evidence-gathering techniques if they are aware that the physical or testimonial evidence produced will be inadmissible at trial. Based on the hypothesis that excluding unlawfully obtained evidence is an effective tool for safeguarding human rights in criminal proceedings, the core question of this comparative project is twofold: How can criminal procedure law ensure respect for human rights and what role does the exclusion of illegally obtained evidence actually play in this regard? In order to answer this question in a global context, we investigated three European jurisdictions (Switzerland, Germany, England), three Asian jurisdictions (People’s Republic of China [PRC], Taiwan/Republic of China [ROC], Singapore), and the United States. The aim of the study was not to find a single universally applicable model of human rights protection, but to determine features that are conducive to enhancing respect for individual rights in different criminal justice systems. In recent decades, human rights have become more prominent in criminal justice systems around the world. This was especially the case following the end of World War II, and, more recently, the Cold War, which essentially divided the world into The East and The West. The right to preserve one’s dignity and privacy, to be free from physical coercion and torture, and the right to avoid self-incrimination are paramount in the criminal process. At the same time, these human rights are especially vulnerable to abuse because they tend to conflict with law enforcement’s primary goal of obtaining information about potential crimes and because the source of such information is primarily human (suspects, victims, and witnesses). For that reason, human rights require special protection in criminal proceedings. The current project starts with the hypothesis that a potentially promising way of providing human rights protections is the exclusion of evidence obtained through violation of a procedural right. This hypothesis is tested by analyzing exclusionary rules and, as far as possible, their practical application in different legal and cultural contexts. It is our goal to determine whether the existence and application of exclusionary rules are an effective means to safeguard human rights in the criminal process and, if so, under what circumstances. In order to test our hypothesis, we considered several aspects of criminal procedure: Under what conditions does a given legal system recognize exclusionary rules? What additional or alternative ways does a system provide to hold authorities accountable? Who may challenge the admission of evidence, and, at what stage of the proceedings? The role of defense attorneys is also addressed, along with the extent and means by which a system separates judicial and executive powers in the context of criminal proceedings. Starting with the adoption of the “Déclaration des droits de l’homme et du citoyen” by the leaders of the French Revolution at the end of the 18th century, the concept of human rights has continued to be a part of the identity of European countries.2 In North America, libertarian ideals and the notion of inherent human rights led to the independence movement, culminating with the adoption of the United States Constitution and its first ten amendments (The Bill of Rights). Based on the philosophical views of the Enlightenment and the idealism of the early 19th century, the Western concept of human rights emphasized the applicability of such rights to every human being regardless of the law in the person’s state of residence. The promise of human rights, the propagation of the rule of law, and progress in the area of civil liberties is a recurring theme in modern criminal justice systems. Many Asian states, including the PRC, have joined major international human rights treaties, such as the International Covenant on Civil and Political Rights (ICCPR) which grants specific procedural rights in criminal proceedings. Additionally, the Member States of The Association of Southeast Asian Nations (ASEAN) executed a regional human rights instrument in 2012.9 As a consequence of the growing prominence of human rights, the domestic laws of some jurisdictions, including Vietnam10 and the Republic of China (ROC),11 have been amended to expressly guarantee such rights. Despite this trend, while the PRC signed the ICCPR, it has neither ratified the Covenant nor incorporated it into national law. After a long debate, Art. 33 para. 3 of the PRC Constitution was amended in 2004 to read that “the State respects and protects human rights.” In 2012, a similar reference to the “respect and protection of human rights” was inserted in Art. 2 of the PRC Criminal Procedure Code (PRC-CPC) and described to be one of several reasons for the newly revised Code. Although these changes to written law may not have a discernible effect upon daily law enforcement in the PRC, they represent a major shift towards official recognition of individual human rights. They may also signify a move away from the strict adherence to Eastern values, which, historically, have afforded limited protections for individuals. Inherent in criminal procedure is the conflict between the state’s interest in determining the facts relevant to a suspect’s guilt (and potential sentence) and the interests of the other parties (i.e. the accused, witnesses, victims). The state’s pursuit of “the truth” has led to the adoption of procedural rules that expose suspects and witnesses to coercive measures. In some jurisdictions this takes the form of a legal obligation to tell the truth when questioned. The recognition of human rights for suspects and witnesses, particularly the right to remain silent, clearly conflicts with the state’s interest in fact finding. Therefore, the potential for state agents to disregard individual human rights in pursuit of “the truth” is a real risk. Preventing human rights violations in the context of criminal procedure thus remains an ongoing challenge and the means available for preventing such violations are limited. Legal prohibitions on torture and other human rights violations, as well as the threat of criminal sanctions and disciplinary measures, may help but are often ineffective due to issues of evidentiary proof and enforcement. The same problem is true where civil damages are offered as a potential remedy. A more promising means of preventing human rights violations is the exclusion of illegally obtained evidence at trial. If, for example, a police officer has unlawfully coerced a suspect’s confession, the confession and, if the fruit of the poisonous tree doctrine is followed, subsequent evidence found on the basis of this confession, all become inadmissible at trial. The rationale behind this rule is the expectation that law enforcement will refrain from engaging in such methods if they know that the resulting physical and testimonial evidence will be excluded. The effectiveness of this incentive-based approach has been challenged on the basis of limited applicability. For example, in cases where a defendant pleads to a charge and is convicted without a trial, as is the case in many jurisdictions, the opportunity to exclude illegally obtained evidence may be limited. Moreover, using the exclusion of evidence as a remedy for human rights violations raises other important questions. Is it acceptable to release an offender who would otherwise be convicted because a police officer has violated a procedural rule? What about the interests of the community and, in particular, of the victim(s)? Should the exclusionary rule also be applied where there was a violation, but the officer acted in good faith? And what should the rule be if illegally obtained evidence, such as a confession obtained under the threat of torture, leads to crucial evidence, like the body of a victim? All of these questions are difficult to answer, particularly where the underlying rationale of the exclusionary rule is not clear: Is the exclusion of evidence meant to discipline police and prosecutors? Is it a means of protecting the integrity of court proceedings? Does exclusion ensure that the trial court does not consider inherently unreliable evidence? Or is the purpose to protect human rights? In spite of these controversial issues, many Western legal systems have followed the United States and adopted a variant of the exclusionary rule with the hope of curbing procedural violations intended to protect individual human rights. Some East Asian jurisdictions have also followed suit and enacted legislation requiring courts to reject evidence obtained through torture or other illicit means. The first part of this project entails a comparison of exclusionary rules and their application in three Asian jurisdictions (PRC, JIANG Na, see also ZUO Weimin/LAN Rongjie; Taiwan, LIN Yu-Hsiung/WANG Shih-Fan/CHEN Chung-Yen/TSAI Tsai-Chen/TSAI Chiou-Ming; Singapore, HO Hock Lai) and three Western jurisdictions (Switzerland, Laura MACULA; Germany, Thomas WEIGEND; U.S. Jenia Iontcheva TURNER). The jurisdictions tend to diverge, not along geographical lines, but rather by legal heritage. There is the common law tradition of the adversarial system (e.g., Singapore, the U.S., England and Wales), the European continental “inquisitorial” system (e.g., Germany, Switzerland, and France), and “mixed systems” (PRC, ROC) all represented in our sample. The project covers a broad selection of legal systems where we can see exclusionary rules at work, and from which we can learn about the possibilities of alternative mechanisms for ensuring compliance with legal rules. The Criminal Procedure Code of the PRC (PRC-CPC, 中华人民共和国刑事诉讼法) dates back to 1979 but underwent a major reform in 1996. After proclamation of the People’s Republic in 1949 and rejection of all former legislation of the Republic of China (founded in 1911), it was the first code of criminal procedure in its history. The original version of the Code emphasized strict enforcement of the law and the language alluded to a strong stance against crime. Confronted with frequent international and domestic criticism of illegally coerced confessions and torture in criminal proceedings,16 the Supreme People’s Court, the Supreme People’s Procuratorate, and the Ministry of Public Security adopted the Rules Concerning Questions about Exclusion of Illegal Evidence in Handling Criminal Cases (2010 Exclusionary Rules).17 A thorough revision of the PRC-CPC culminated in an amended version of the Code, which was passed in 2012. This updated version of the Code was intended to better protect the human rights of defendants. For example, Art. 50 PRC-CPC grants the right against self-incrimination and Art. 54 PRC-CPC provides for the exclusion of statements obtained by illegal means, particularly by torture. However, the PRC-CPC does not acknowledge the fruit of the poisonous tree doctrine and, as a result, secondary evidence obtained through torture or other illegal means remains admissible at trial.18 The breadth of this exclusionary rule as interpreted by Chinese prosecutors and courts has yet to be seen. By contrast, in Singapore there is no explicit constitutional prohibition of torture, nor is there a constitutional provision on the exclusion of illegally obtained evidence. However, Section 258(3) of the Criminal Procedure Code, read together with Explanation 1, renders inadmissible any statement by an accused obtained through “inducement, threat or promise” or by oppression. Section 258(3) does not cover all cases of illegally obtained evidence and it does not apply where the evidence is anything other than a statement (i.e. physical evidence). Whether the judicial power of exclusion extends beyond cases covered by Section 258(3) remains a contentious matter. However, in recent years the Singapore courts have narrowed the scope of exclusionary discretion,27 thus sacrificing the protection of individual liberties for the state’s interest in convicting wrongdoers. The reports included in this publication address the question whether, and under what circumstances, the use of exclusionary rules is an effective means for protecting human rights in criminal proceedings. We started with the hypothesis that the exclusion of illegally obtained evidence could potentially be an effective tool for ensuring that certain human rights are respected in criminal proceedings. Given that the starting point for any legal comparison is the law itself,28 an analysis of the existing legal rules in the selected jurisdictions was needed to test our hypothesis, which was done via individual country reports. In the interest of comprehensiveness, our study sought to look beyond the law to its application. If the primary goal is the protection of human rights, states need not only establish the corresponding legal framework, but also incentivize law enforcement to abide by such provisions. Cultural values appear to heavily influence a number of criminal justice systems, particularly those that place a strong emphasis on confessions, presumably as a result of the societal belief in the importance of admitting wrongdoing and experiencing regret. In such systems, the desire to extract a suspect’s confession may override any concern that the confession could later be deemed inadmissible.29 Importantly, the efficiency of criminal justice systems is affected by aspects outside the law, including tolerance of abuse by state authorities and support of state authority over civil rights. In the current study an effort was made to consider relevant cultural norms, as well as the social roles of the police, prosecutors, and the courts. One defining feature of our project is its emphasis on social and inter-cultural discourse, which are directly linked to the overarching debate of whether human rights are universal or culturally-relative. By studying human rights protections in criminal procedure within selected European, American, and Asian jurisdictions, we sought to highlight the extent to which the effective protection of suspect and witnesses’ rights has been recognized as a necessity in both the East and the West, and how it is linked to the implementation of exclusionary rules. 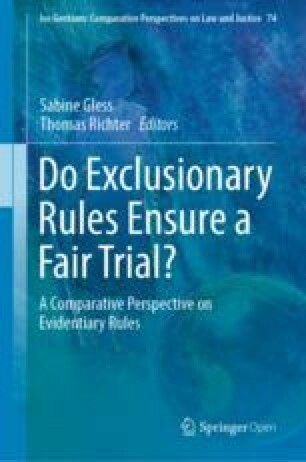 This analysis is covered in five topical chapters: The Purposes and Functions of Exclusionary Rules: A Comparative Overview (Jenia Iontcheva TURNER and Thomas WEIGEND), Exclusionary Rule of Illegal Evidence in China: Observation from Historical and Empirical Perspectives (ZUO Weimin and LAN Rongjie), The Fair Trial Rationale for Excluding Wrongfully Obtained Evidence (HO Hock Lai), Securing a fair trial through exclusionary rules: Do theory and practice form a well-balance whole? (Susanne KNICKMEIER) and Exclusionary Rules—Is it Time for Change? (Sabine GLESS and Laura MACULA). The European Court of Justice (ECJ) has referred to human rights as the value system common to all EU member states, ECJ judgment of 13 December 1979, Hauer v Land Rheinland-Pfalz, C-44/79, § 15. For the implications on the understanding of human rights in criminal proceedings, see, for example, Jiang, 2013 at 745 et seq. Information Office of the State or China’s Cabinet, White Paper on Progress in China’s Human Rights in 2012, Beijing May 2013 <http://news.xinhuanet.com/english/china/2013-05/14/c_132380706.htm>, accessed 19 November 2018; Freeman/Geeraerts, BICCS at 7 et seq. See Zakaria, Fareed, A Conversation with Lee Kuan Yew, Foreign Affairs March/April 1994. See also Elgin, 2010 at 138. See, for example, Steiner/Alston/Goodman, 2008. See Parlett, 2011; Klabbers/Peters/Ulfstein, 2012; Peters, 2006. The ASEAN Human Rights Declaration was adopted by Brunei, Cambodia, Indonesia, Laos, Malaysia, Myanmar, the Philippines, Singapore, Thailand and Vietnam on 18 November 2012; <https://asean.org/asean-human-rights-declaration/>, accessed 19 November 2018. For Vietnam, see Nguyen, 2009 at 1 et seq. Human rights law in Taiwan is primarily domestic law because the United Nations has decided to recognize the representatives of the Government of the PRC as “the only lawful representatives of China to the UN” (UN Resolution 2758 (XXVI) of 1971) and have thus excluded the ROC from official participation in UN organizations. The Swiss Criminal Procedure Code outlaws torture in Art. 140 para 1 and requires all authorities to treat fairly everyone involved in criminal proceedings (Art. 3 para 2). Art. 141 CH-CPC declares in absolute terms that any evidence acquired through torture or other undue coercion is inadmissible, but grants the trial court discretion when other procedural rules have been violated. German criminal procedural law recognizes the right to a fair trial and prohibits the use of torture and coercion in any interrogation of a suspect or witness (§§ 136a, 69 sec. 3 Code of Criminal Procedure, DE-CCP). There is no general rule prohibiting the use of illegally obtained evidence, but statements made after prohibited means of interrogation have been used cannot be used as evidence (§ 136a sec. Art. 3 DE-CCP). With respect to most other violations of procedural rules or human rights, the DE-CCP does not explicitly provide for exclusion and courts follow a case-by-case approach. In recent years, the Federal Constitutional Court has shown an increased readiness to exclude illegally obtained evidence, especially where law enforcement authorities had intentionally violated the suspect’s rights or applicable procedural rules. See, for example, German Bundesverfassungsgericht of 12/04/2005–2 BvR 1027/02, 113 Entscheidungen des Bundesverfassungsgerichts 29 (2005). Torture is implicitly barred by Code of Practice C for the Detention, Treatment and Questioning of Persons by Police Officers made under s. 66 Police and Criminal Evidence Act 1984 (PACE), which sets minimum standards of treatment and specifies procedural and welfare rights. Under s. 76(2)(a) PACE, the court must exclude a confession if the defendant asserts that it was obtained by oppression and the prosecution fails to demonstrate that this was not the case. Oppression is partially defined as including “torture or inhuman or degrading treatment”. Although the English courts are tolerant of the enhanced psychological pressure experienced by a suspect under interrogation (Holgate-Mohammed v Duke  A.C. 437; Fulling  2 All E.R. 65; Heaton  Crim L.R. 593), extensive hectoring or bullying of a suspect will be treated as oppression (Paris, Abdullahi, Miller) , 97 Cr.App.R. 99). Additionally, under s. 78 PACE, the court has discretionary power to exclude any prosecution evidence where, having regard to the circumstances in which the evidence was obtained, the admission of the evidence would have an adverse effect on the fairness of the trial. See He/He, 2013 at 73 et seq. Rosenzweig et al., 2013 at 466–467. For an English translation (dating from 2007) see: <http://law.moj.gov.tw/Eng/LawClass/LawContent.aspx?PCODE=C0010001>, accessed 19 November 2018. See He, 2011 at 172 et seq. See Lin, 2003 at 224 et seq. See Lin, 2013 at 190–195. See, for example, § 156 para 3–4 TW-CCP. See Liao, 2009 at 223 et seq. §§ 156, 158–2, 158–4 TW-CCP. In 1964, the majority in Cheng Swee Tiang v PP acknowledged the existence of a broad and general discretion to exclude unlawfully obtained evidence. This discretion was to be exercised on a case-by-case basis by balancing “the interest of the individual to be protected from illegal invasions of his liberties” against “the interest of the State to secure evidence bearing upon the commission of crime and necessary to enable justice to be done shall not be withheld from the courts on any merely technical ground”. The existence of this exclusionary power was put in doubt by the decision in the 2007 case of Law Society of Singapore v Tan Guat Neo Phyllis. In Muhammad bin Kadar v PP, the Court clarified that a general discretion does exist but held that the discretion was available only where the prejudicial effect of the wrongfully obtained evidence exceeds its probative value. See, for example, Ellis, 2011 at 971.